Vapor proof lights have been around for over a century now with minimal changes to its simplistic design. Characterized by its “Caged” look, with a metal mesh protecting the Bulb inside from physical damage and a sealed glass jar, protecting from the moist night air that can corrode wiring as well as potentially explosive gases. They were the first attempt at “Explosion proof” exterior lighting for damp and dangerous environments. These type of fixtures can be difficult to upgrade to Energy Efficient lighting (CFL or LED), the enclosed nature of these lamps can cause premature failure due to lack of ventilation. 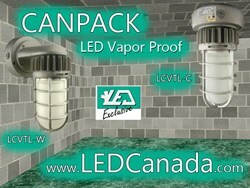 The Canpack LCVTL Vapor Proof uses only 17 watts of 5000k LED to replace its 100 watt incandescent equivalent, IP67 for complete waterproof protection, watertight junctions, evenly distributed light pattern with sandblasted glass to reduce glare, Heavy duty Cast body with integrated heat-sink, and of course, full cULus certification. One size does not fit all, Canpack has released a Wall mount Vapor light LCVTL-W as well as a ceiling mounted Vapor light LCVTL-C, both models have 5 removable threaded plugs for endless installation combinations. LM79-80 tested for 50,000 hrs. of active duty, up to 10 years totally matanence free. Heavy duty Silicone gaskets along with Stainless Steel screws ensure our housings last as long, or longer than the “Cree™” COB LED and “International™” Driver combination. Canpacks goal was to offer a true 100 watt Vapor proof replacement without straying too far from the original design and to make it cost effective, without sacrificing quality. Vapor proof lights are highly recommended for Marine and damp environments. Canpack LED Vapor-lights look great in any commercial or residential setting, offering reliable, efficient Lighting for exterior and architectural applications. Available exclusively from LED Canada and its distribution network.